South Africa: Are Sharks Being Attacked By Killer Whales Off Cape Town's Coast? A broadnose sevengill shark in False Bay. However, the structure of the False Bay food chain began to change significantly in 2015 with the appearance of a "new" predator, shark-eating killer whales. 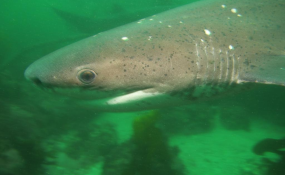 The change was noted with the discovery of several dead sevengill sharks by scuba divers from a popular dive site inside the Table Mountain National Park marine protected area. This site was home to an exceptionally large group of sevengill sharks. Divers could dive with up to 70 sharks on a single hour-long dive - no other place in the world had this many broadnose sevengill sharks in one place. With this information in hand we set about reviewing the literature on killer whale behaviour, dietary specialisation, and population delineation globally and locally. Based on the review we hypothesised that the attacks on broadnose sevengill sharks in False Bay were possibly indicative of the arrival of a different sub‐group - or ecotype - of killer whale in the bay that feeds on sharks. At the same time as the first discoveries of the dead sharks, a local whale watching charter documented the arrival of two new killer whales in the bay in January 2015. These individuals were easily identifiable by their characteristic bent over dorsal fins, and were nicknamed "Port" and "Starboard" and were sighted near the sevengill aggregation site at the time of both incidents in 2015 and 2016. Similar to the sevengill sharks, the wound pattern was the same and the shark's livers were missing. Examination of the carcasses by scientists showed that the sharks had large, gaping wounds between their pectoral fins and their livers were missing, while the rest of the internal organs like heart, stomach and reproductive organs were left behind. There were distinct bite marks on the pectoral fins of the dead sharks. These evenly spaced, circular tooth impressions were identified as most likely being from a "flat-toothed" killer whale, which is rare in coastal waters. There were no bites anywhere else on the body, indicating that the killer whale (or whales) had likely pulled on the pectoral fins to open up the body cavity, to remove the liver. The sharks' liver accounts for up to a third of its weight and is rich in fat, a nutrient that killer whales seek out. Killer whales started targeting sea otters and caused massive declines in their abundance. The declines were documented between 1990-1997 by population surveys conducted across the Aleutian archipelago. This in turn had a knock-on effect as sea urchin (sea otter food) populations exploded. As sea urchins' primary food is kelp, this increase resulted in the deforestation of kelp forests in the region. Currently, the once popular sevengill aggregation site is largely abandoned, with only rare sightings. Great white shark sightings have also declined in False Bay, possibly in part due to the presence of these killer whales. There are substantial gaps in our understanding of killer whale behavioural ecology in South Africa, but what's evident is that the presence of these shark specialists could have profound and cascading impacts on the ecosystem.